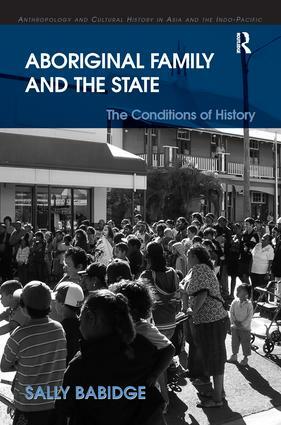 Aboriginal Family and the State examines the contemporary relations and history of Indigenous families in Australia, specifically referencing issues of government control and recent official recognition of Aboriginal 'traditional owners'. Drawing on detailed empirical research, it develops a discussion of the anthropological issues of kinship and relatedness within colonial and 'postcolonial' contexts. This volume explores the conditions affecting the formation of 'family' among indigenous people in rural northern Australia, as well as the contingencies of 'family' in the legal and political context of contemporary indigenous claims to land. With a rich discussion of the production, practice and inscription of social relations, this volume examines everyday expressions of 'family', and events such as meetings and funerals, demonstrating that kinship is formed and reformed through a complicated social practice of competing demands on identity. Sally Babidge is a Lecturer in Anthropology at The University of Queensland, Australia.